A highly automated hot dip process in conjunction with controlled temperature is employed to process the galvanized steel. In order to produce galvanized steel with excellent resistance to corrosion, rust-free and devoid of any galvanizing defects, zinc and antimony etc. of highest purity are applied with proper pre treatment of the substrate and controlled process of galvanizing. To further enhance the quality of sheets and make it white, rust proof, a special chemical treatment is applied on the zinc coated surface. 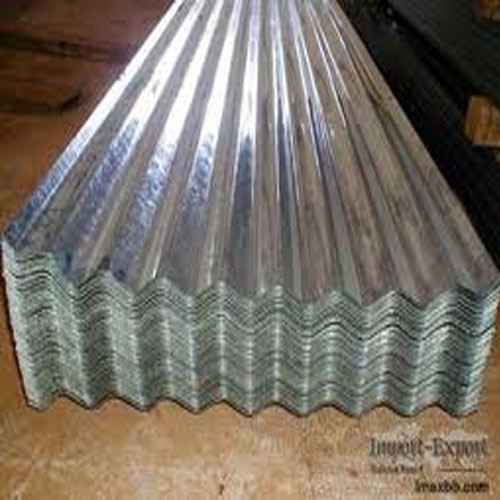 Our wide range includes both plain and corrugated galvanized sheets and coils. Backed by loaded industry experience, we are engaged in manufacturing, exporting and supplying Seamless Pipes, Aluminium Wire Rods, Cast Copper Rods, Copper Cathodes, Steel Alloy Bars, TMT Construction Bars and Wire Rods. We also offer Cold Rolled Steel Sheets & Coils, TMT Construction Bars, Aluminium Wire Rods, Steel Alloy Bars, Wire Rods, Cast Copper Rods, Copper Cathodes, Seamless Pipes and Bentonite Clay. The offered products are extensively appreciated amongst clients for features like dependable performance and amplified levels of durability. In addition, we are also engaged in Galvanization process. At our quality inspection unit, we strictly scrutinize each product, which results in their compliance with industry parameters. With a client oriented approach, we have built a sturdy client base spanning all over the country like Egypt, South Africa, Namibia, France, Germany, Italy, Portugal, Switzerland, Sweden, Norway, Finland, Spain, Austria, Slovak Republic, Creek Republic, China, Vietnam, Malaysia, Singapore, Hong Kong, Indonesia, Australia and New Zealand, Dubai, Lebanon, Iran, Oman, Finland and Russia.